Muizenberg, a South Peninsula suburb of Cape Town, has a sandy bottom and a gentle beach break. 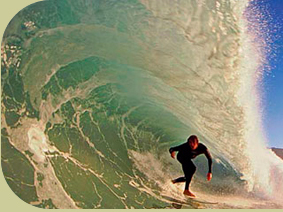 It is renowned as one of the best places to learn surfing. In addition, depending on the size of the swell, Muizenberg can also be the perfect spot for longboarding pro's as well as shortboarding enthusiasts. Danger Beach, Electrix and Kalk Bay Reef which are no more than a few minutes drive away are certainly the surfspots to smack the lip, ride a tube and get barrelled. Muizenberg is Cape Town’s prime spot for all levels and preferences of surfing, paddle surfing, paddles skiing, boogy boarding etc. Click here if you are interested in learning how to surf. click here for today’s Muizenberg surf report. When the wind is strong and blowing onshore consistently, kite and windsurfers alike flock to the beach for their bit of fun in the sea. You’ll find great conditions for riding waves and flying high at all levels, even as a kiteboarding novice. Want to learn to kitesurf in Muizenberg? Click here. Click here if you want to learn about kiting or buy kiting equipment. Muizenberg offers a wide variety of surf schools, board shapers and surf shops for surf equipment sales and rentals. Many of them are located right on the beachfront and only a short walk from the Seaview Cottage guest house. Check out Africa’s oldest surfshop just 500m from the cottage - for a preview click here. Want to know more about kitesurfing in Africa, click here. A wetsuit is recommended for surfing, kiting and other watersports throughout the year. So here it all is, waiting for you, only a short distance from your accommodation. Come and surf!